Home > News > British cars > Land Rover Defender tests with inline-six: Video! 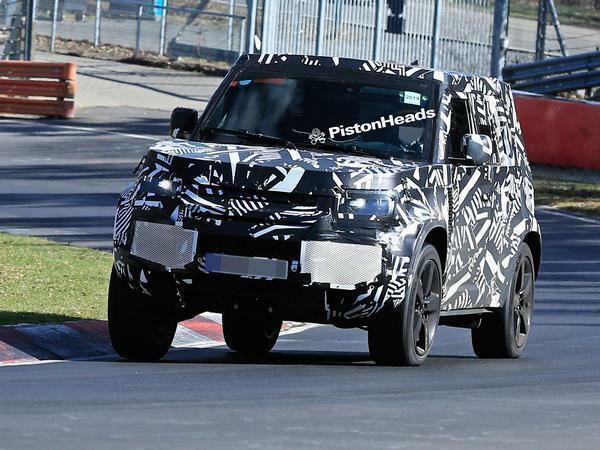 Land Rover Defender tests with inline-six: Video! 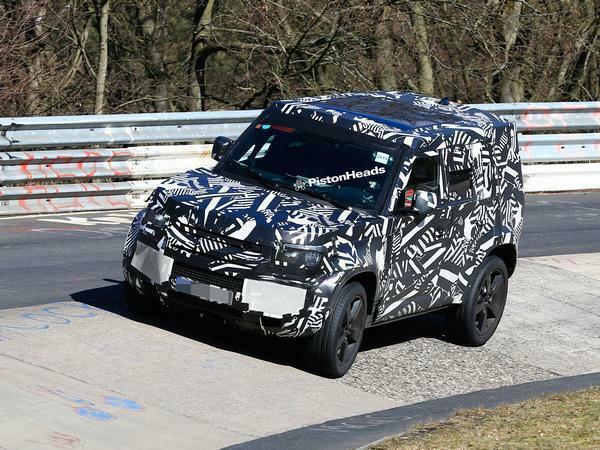 New footage of a Land Rover Defender charging around the Nurburgring suggests JLR is developing a sporting variant that will use its new turbocharged six-cylinder engine. Although largely obscured by the loud tyre noise produced by its wide rubber, the smooth tone of a petrol six can be heard from within the bowels of this test car, which we must say, is being driven in a manner not usually assigned to Defenders. The new 3.0-litre inline-six, which supersedes JLR’s V6 of the same capacity, has already been introduced via the Range Rover Sport HST, where it produces 400hp. We know the unit will be tuned to suit different applications, so, if it does find its way into a Defender, it wouldn’t necessarily be as potent. But it does back ongoing speculation that JLR will launch a quick(er) Defender to appease demand for such a variant. The company may well have been buoyed by the success of its Defender Works V8, which sold out in just four weeks at the start of 2018. 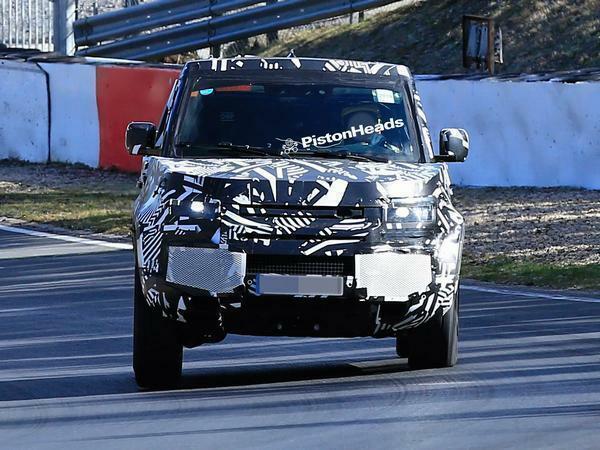 But while that final version of the old Defender was still very much a rugged machine true to the early cars, the upcoming 2020 car will be based upon JLR’s new aluminium Modular Longitudinal Architecture (MLA), meaning it will be an entirely different proposition and one better prepared for a powerful engine. The effects of the MLA’s setup are clear in the way the spied development off-roader appears comfortable being flung around the mini Karussell, its independent rear suspension doing a good job of keeping the boxy body upright. It also points to a stiffened suspension setup to join those large diameter alloys. That’s not to suggest an inline-six Defender would necessarily be a full-blown road-biased version in the vein of an SVR; the thickness of the tyre walls hinting at an unimpeded off-road ability. Few of us would doubt the sales potential of a hot Defender, but would its introduction harm the model’s reputation amongst enthusiasts? Let us know what you think below. There are so many question - why probably being the main one. The closest an old Defender will have got to a lap of the 'ring would have been pulling a car from the gravel at Aremberg, so to see the new car there deliberately doing a lap is something of a surprise. Or is it? 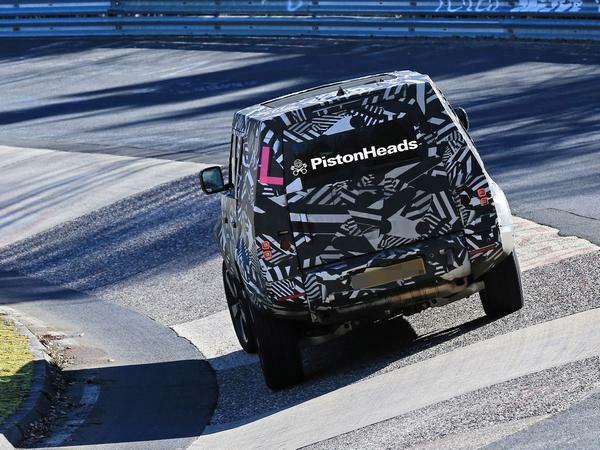 The Defender's road manners will have to be improved this time around, and arguably there isn't a much better place to sign off dynamic behaviour in extremis than the Nordschleife. Naturally the road routes in the UK will be a priority for testing, but road cars are tested on this circuit so frequently for a reason - because so much challenge is packed into such a relatively short amount of distance and time. Further interest comes from working out just what this Defender is. Previous development mules have sported smaller wheels (including one on the rear), which this one has ditched in favour of lower profile tyres and bigger rims. Note too a new exhaust arrangement; before two pipes have been paired to the side, whereas now they exit separately. Could this be a sportier petrol model, where those we've already seen have been diesel? It'll be a shock to the die-hard fans to see a Defender with any kind of focus beyond scaling every mountain and fording every stream, but there can be no denying the demands of modern customers. Otherwise, it's the silhouette that's become familiar over the past few months, boxy and blocky in the best Defender tradition. 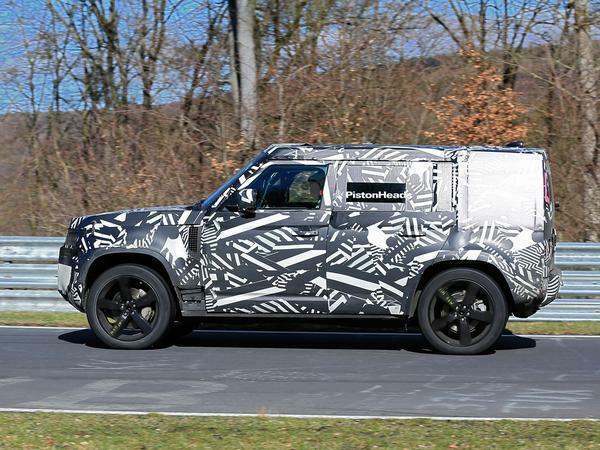 While there's still plenty of cladding to disguise the true Defender details underneath, it would seem the basic proportions are nailed on - the overhangs are short, the wheels pushed right out to the corners, and the curves that have come to characterise recent Land Rover design conspicuous by their absence. Furthermore, while it's not exactly at home on the track, heaving about on its springs quite markedly, there's no doubting it'll be a heck of a lot more composed (and faster) than any previous Defender you care to mention. 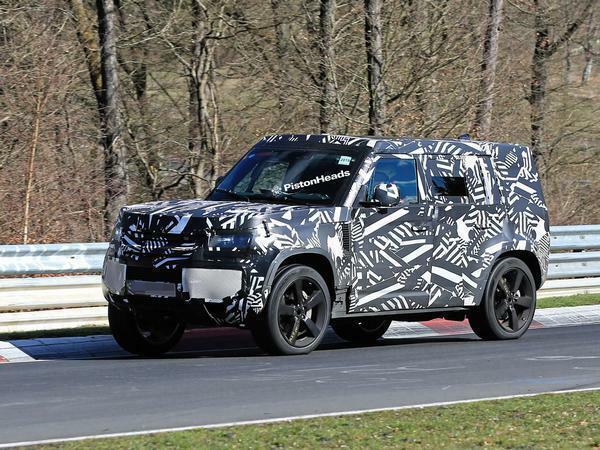 So that's the latest in the new Defender story: it has been around the Nordschleife at least once. With it still believed to be a 2020 car, expect more surprises to follow - a run at Santa Pod, perhaps - over the next few months. It's getting closer! Oh yes! Promises well for the replacement mud-plugger! It's a Defender Jim, but not as we know it. Well it doesn't look very agricultural - are they abandoning the farmers to the Jimny? I hope the final product is as moorish to look at as the outgoing model.